Rosy Outlook: 1 Sweater 2 Ways + FF Link-Up! 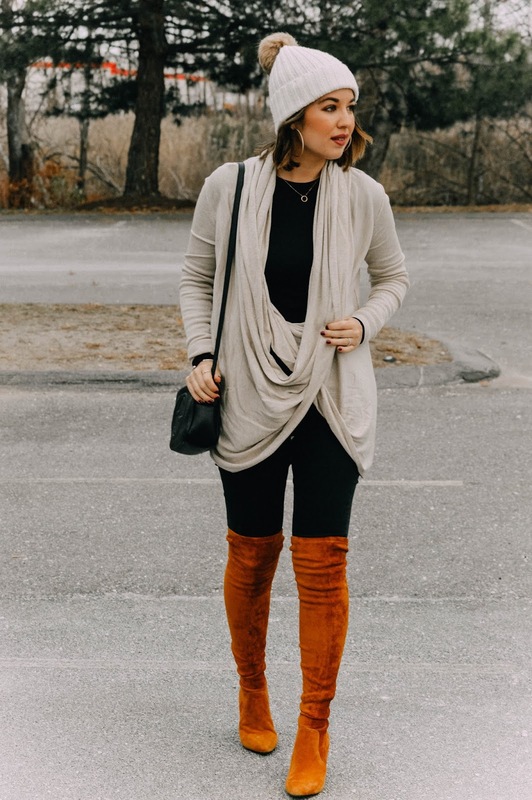 1 Sweater 2 Ways + FF Link-Up! Happy Wednesday loves! Hope you're having a great week so far. Mine has definitely been busy as the new job is ramping up but I'm loving it! Y'all, I feel like I'm having a total mental block with Christmas gift ideas this year. I'm hoping once I start doing my gift guides every Friday (starting this week) it will start sparking some ideas on what to buy family and friends but I'm really struggling to come up with anything "creative." Any suggestions would be appreciated! ....however this sweater is one thing that I do think would make a GREAT gift! I love that you can wear it two ways so it's basically like a two-in-one gift. Both ways look gorgeous and it's such a cozy piece for this time of year! Also, I know these boots are SUPER popular all over the 'gram and I'm thinking about doing a separate review post on them. I bought these and another pair of black OTK boots by a different brand and I thought I could talk about both. Let me know if that's something you would want to see! Yes they do!! They're VERY fitted around the thigh almost like a sock. When I first put them on I almost thought they were too tight around my thigh but they stretch just a little bit and are perfect now! That is the coolest cardigans and your are the cutest! That cardigan is fabulous! It's so cute styled both ways! Thank you so much for the feature! Love how this sweater can be worn two ways, so cute! And those boots... obsessed! I've been wanting them in a different color and I love this color! Those boots are so fun and the color is so rich! 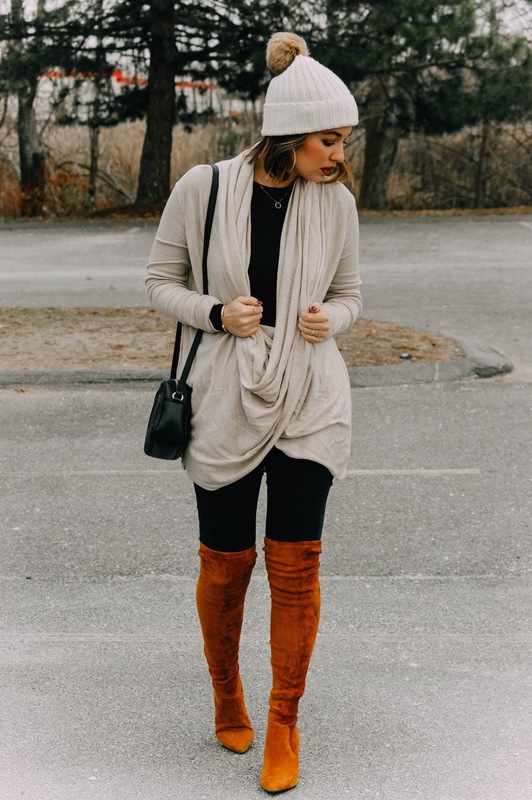 This sweater is so fabulous and versatile! Definitely a perfect gift! 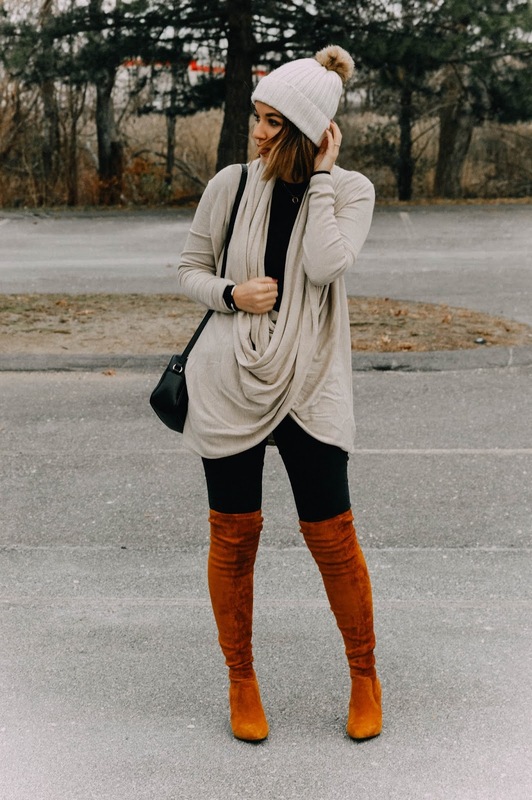 Love this whole outfit; especially those boots! I love how this is styled! And the boots are amazing. 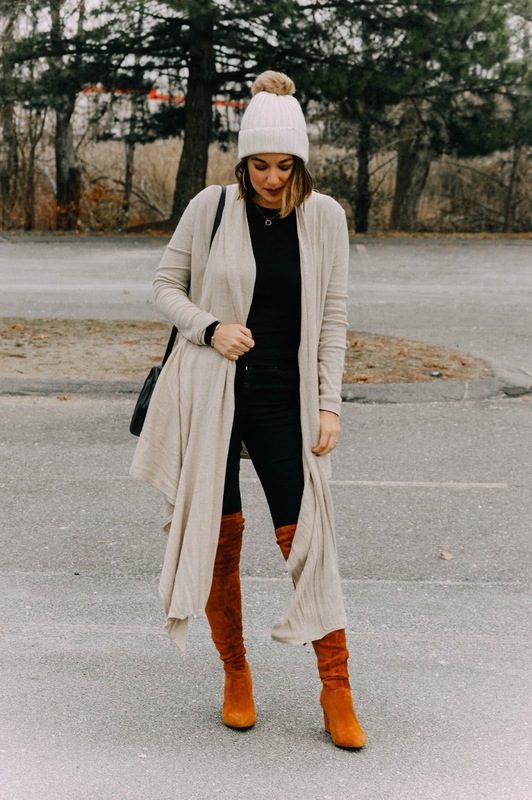 I love the draped look of the waterfall cardigan, it looks so cozy! cute looks! love your boot style! Ah the boots and that sweater are perfect! They compliment each other so well and each is stunning! This sweater is so cute and versatile! I love it paired with those boots! Thank you so much for the feature this week!! I really love both ways you styled this sweater- how chiiiiiic! I love your outfit! Looks so cozy! Lovely look dear! Can't go wrong with those boots, really chic contrast from the neutral colors. So lovely on you Kelly!